In the previous installment of this article, I advocated that brewers keep their wort or beer covered whenever it is not in a sealed vessel and to minimize the amount of time that it is exposed to the open air. Both of these things should reduce— although not eliminate — the amount of airborne contamination in your beer. It’s my contention that, even when you normally produce beer that does not taste overtly contaminated, further reducing the level of contaminants further benefits your beer. 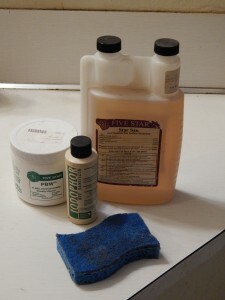 In this post, I’ll cover a couple of minor details, and one important — but frequently overlooked — aspect of sanitation. In the case of loosely covering your brewpot with a sanitized lid (and maybe draping the lid with clean T-shirts to cover the crack between the kettle and the lid), this doesn’t keep out all airborne contaminants, it only lessens the amount. You can think about it like this. Let’s say you’re brewing and there’s a smoky campfire 20 feet or so from your brewing rig. A light breeze is wafting the smoke towards you as you brew. When chilling your wort, will loosely covering it keep all of the smoke out? No, it won’t. Some smoke is going to get into the kettle as you cool. 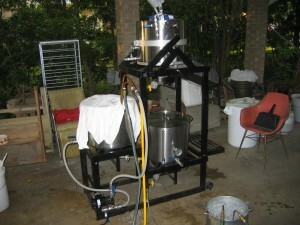 (And, as you chill the wort, the air above it will also cool and contract, pulling more smoky air into the kettle.) However, covering the wort would lower the amount of smoke that wafts across the top of your wort. Likewise, if you were bottling near a campfire, working quickly would not eliminate smoke getting in your bottling bucket, but it would decrease the contact time. Neither of those measures is an all or nothing thing, but a matter of degree. Temperature, alcohol concentration, pH, and nutrient levels all influence the growth rate of contaminating microorganisms. Of course, in most cases, these variables are going to need to be adjusted for reasons others than slowing contamination. For example, once the wort is pitched, holding it near freezing would slow the growth of unwanted contamination. But, of course, you need the temperature much higher than that for a healthy fermentation. Still, it pays to understand all the variables that influence the growth of contaminants, because sometimes you can alter them to further your sanitation goals. The biggest thing you can do in this respect is chill quickly through “the danger zone” — the range of wort temperatures between those warm enough to foster fast microbial growth and pitching temperature. I wrote an entire article on this awhile ago. Long story short, once your wort is no longer hot enough to kill “bugs” that drop into it, cool as quickly as you can reasonably manage to reach your pitching temperature. And pitch promptly. Pitching an adequate amount of yeast is not usually considered a part of brewers cleaning and sanitation routine. However, adequate yeast pitching does the following things: It quickly starts producing alcohol and lowering the pH of the fermenting wort. Both of these inhibit most contaminating microorganisms. It almost immediately takes up most of the oxygen added to the chilled wort and quickly starts consuming sugar and micronutrients — all of which could otherwise be used by contaminants. A quick start to fermentation allows the brewers yeast — which are well adapted to wort — to “crowd out” competing microorganisms. Your wort is most susceptible to contaminants when it is chilled and aerated. So, pitching comes at the perfect time to do something about the inevitable contamination in your wort. If you make an adequately sized yeast starter (based on online calculators) and pitch at fermentation temperature (or slightly lower), you are lowering the possibility of some “bug” getting a hold early in your fermentation. Making a larger than recommended starter may help further, but isn’t recommended because pitching rate affects the characters given off by the yeast during fermentation. Higher pitching rates lead to “cleaner” beers. This is especially true for yeast strains that add lots of esters, phenols, or other bits of character to beer. 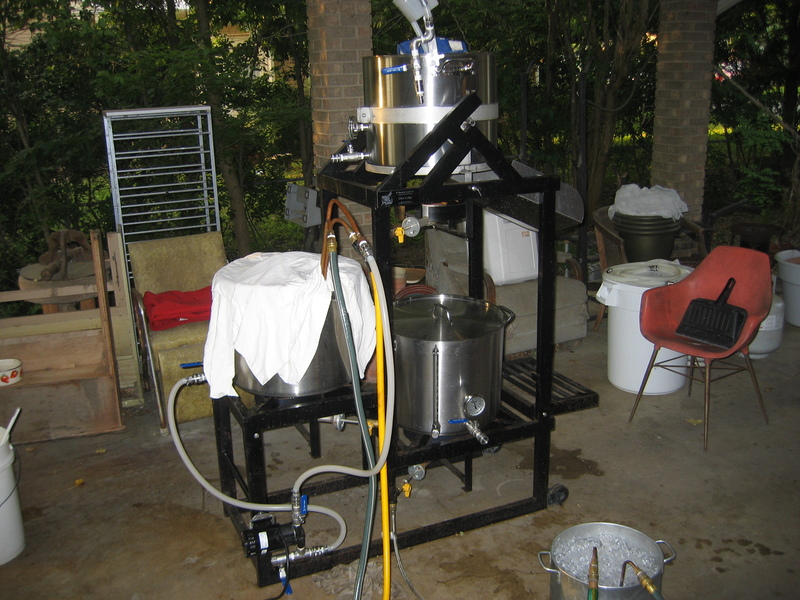 If you are making yeast starters and pitching enough yeast, there’s nothing more for you to do. However, if you aren’t — and your beers suffer from long lag times before fermentation starts — you’re just giving bacteria and wild yeast a time to multiply. Find a way, whether by making a yeast starter or purchasing more yeast, to be pitching an amount of yeast in the ballpark of the optimal amount. So, in a nutshell, there are several components to cleaning and sanitation. You must clean your equipment until it’s spotless and then sanitize it somehow. This can be with heat or, as is most common, by using chemical sanitizers. That’s the most important part. Secondarily, there are things floating in the air all around you. When brewing, know that you are continually in an ultra fine, smoke-like, mist of bacteria and wild yeast. Do your best to keep sources of these away from your brewing area. Also, cover vulnerable wort or beer and work quickly whenever it needs to be exposed. Additional things you can do is learn how all the various sanitizers work. Likewise, learn what “sterile technique” or “aseptic technique” is. This is how biologists handle microorganisms in order to maintain pure biological cultures and should give you ideas about how to handle yours. You won’t be using the same equipment or performing the same tasks, but the mindset is informative.